Dustless blasting is the future of surface preparation. This revolutionary technique uses abrasive media encapsulated inside water droplets to remove paint and rust from nearly any surface. The machinery is designed to work with a variety of different media. This technology can accommodate glass, ground walnuts, sand and baking soda. The water molecules makes it possible to perform this task without containment. In the past sandblasting required a dedicated area because of the toxic dust plumes that would form and permeate the atmosphere. The dust plumes are toxic because the silica molecules in sand are known to cause serious respiratory diseases. Dustless blasting is efficient in three ways. Traditional sandblasting requires a contained area due to the toxic dust plumes that form during the process. When the media is encapsulated inside water molecules, dust plumes don’t have an opportunity to form. It is unnecessary to spend time and labor containing the treatment area. This unique technology makes it possible for our blasters to cover more square footage per minute. Lastly, the clean up process is minimal due to the efficient usage of water molecules. Less labor and time required translates directly to lower costs for you. When you inspect sand with the naked eye, all you can detect are tiny grains. When you examine these grains under a microscope, the technology will reveal beautifully complex crystals called silica. When humans breathe silica, it irreparably damages our lungs. The most common disease to occur as a result of exposure to silica is silicosis. These toxic molecules lodge themselves within the lung’s membranes and wreak havoc on the human respiratory system. OSHA mandated that proper safety equipment must be worn when working with sand. 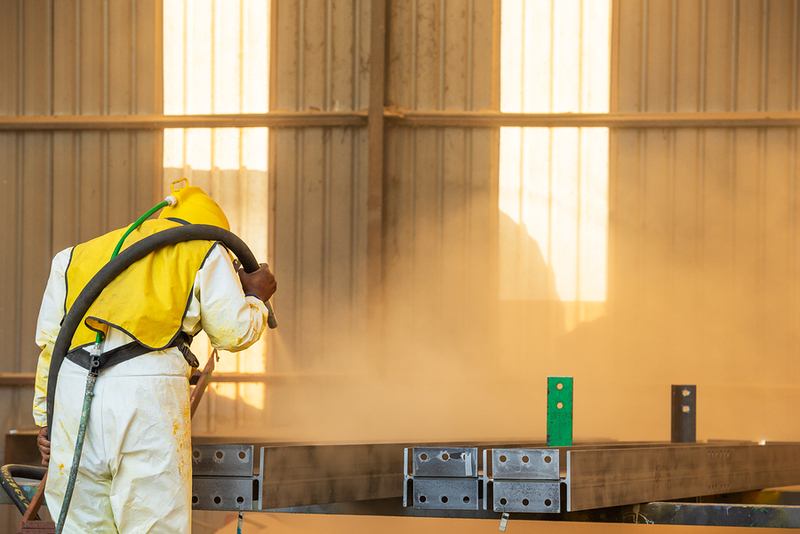 With the invention of dustless blasting a respirator mask is no longer necessary. Additionally, containing the work environment is no longer necessary. Dustless blasting can be used for a variety of commercial and residential applications. This process has the capability to remove any paint and rust from any surface without damaging the substrate. Once the undesired surface is removed, the customer can opt to repaint, reseal or stain the object. You may also choose to leave it raw and unfinished. Dustless blasting is recommended for restoring interior brick, stone and wood surfaces. If you are renovating your home, consider this service. This process is also wonderful for stripping paint off cars and removing rust from industrial equipment. For a complete list of surface applications, contact us for a complimentary consultation. Media refers to the abrasive substance used to remove paint and rust from various surfaces. There are a variety of media available. For more delicate surfaces our team of blasters will employ baking soda coupled with a low PSI for efficiency without damage. Oilrigs, steel hulls and cars are extremely durable. Our team will use sand or metal with a high pressure for more dense surfaces. In the past we have used baking soda, glass, sand, ground walnut shells and metal to get the job done. To minimize the clean up time even further, we prefer to incorporate baking soda for its watersoluble properties.